Editor’s Note: We feel that this magazine has been exceedingly fortunate in securing R. Sidney Bowen to conduct a technical department each month. It is Mr. Bowen’s idea to tell us the underlying principles and facts concerning expressions and ideas of air-war terminology. Each month he will enlarge upon some particular statement in the stories of this magazine. Mr. Bowen is qualified for this work, not only because he was a war pilot of the Royal Air Force, but also because he has been the editor of one of the foremost technical journals of aviation. WELL, maybe I’m getting good, or maybe you buzzards have ganged up together and decided to kid your old Uncle Wash-out. But anyway, I’m certainly getting a flock of letters asking me all sorts of questions. And would you believe it?—most of them are real sensible. They almost make me believe that you apes keep your ears buttoned back when I start to talk. As I said, maybe I’m getting good, and then again maybe I’m—! Oh, well, we’ll let that one go this time. However, it all leads up to the fact that I’ve just received a note from Tony Battagalia out in Chicago. Now there is a buzzard who does his sleeping in the night time only. He keeps his eyes open while the sun is shining—and even on rainy days, too. In his note he tells me what a wonderful war eagle I must have been (which of course is quite correct), and then he asks me to get in a few words about formation flying. Well, I was going to speak about knitting woolen helmets for high altitude flying, but in view of the fact that Tony wants to hear about formation flying then that’s what he’s going to hear about. Of course some of you other buzzards may think that you know all about that sort of thing. If you do just stick your chins in your vests and don’t snore too loud. Tony and the other lads crave information, so take a tip and shut up. FORMATION flying is, of course, just what the two words signify—flying together in a group in a definitely arranged group. And why? Of course you can guess. When soldiers march they don’t go along the street in mob fashion, half of them in the gutter and the other half shuffling across peoples’ front lawns. No, they march in closed order. And the main idea is so that the whole group will execute an order as though they were one man. The same idea holds true for cavalry, gun batteries, tanks, etc. Formation is maintained so that the group will act as a solid unit. Now, that is great stuff for the fighting forces on the ground. They can march into battle in formation positions, and in some cases they can fight a battle and still keep their formation. In the case of infantry going over the top, they go over in what are known as waves. The first wave is a line of soldiers spaced so many feet apart. In some cases it may be two lines. Then comes the second wave, and if necessary a third wave. But what I’m trying to bring out is that the soldiers advance upon the enemy in formation. When they meet the enemy and it becomes a case of hand to hand conflict, their original formation is of course broken up. But up to that point, the soldiers that were not killed while advancing across no man’s land kept an advancing formation that made it possible for their officers to maneuver them as a solid group. THAT is exactly what happens in the air—planes fly in formation not because it looks pretty, but so that all of them will maneuver as a fixed body when the signal comes from the pilot in command. Troops on the ground march behind their commanding officer. The reasons for that are, first; an officer leads his men. That’s why he’s an officer. Second, so that they will be able to see or hear his commands and execute them as a unit. So naturally, it follows that the commanding air officer leads his pilots through the air. And the best way to lead them is when they are flying behind him in formation position. When in formation they can see his signals, and by looking back he can see them. Now, that brings us up to the matter of the various types of aerial formations, their names, and their uses. The first is, of course, the most common one of all. It is called the V formation. (Fig. 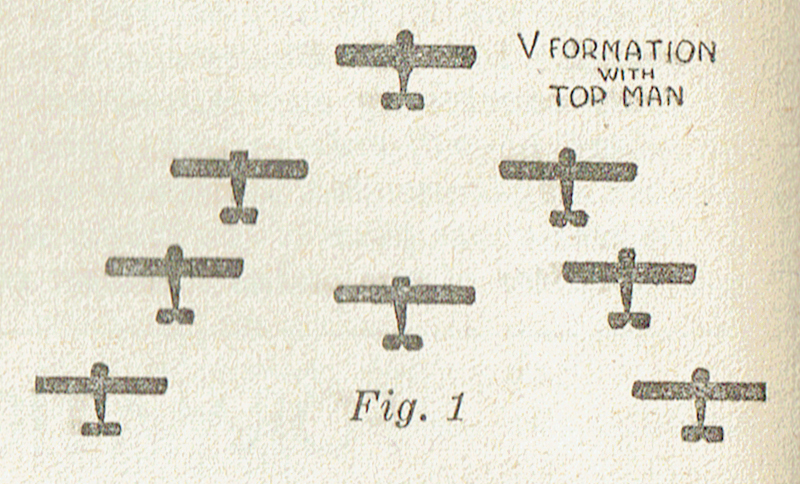 1) A V formation can be made up of any number of planes, from three to six billion, if you want that many. The officer in command flies at the peak of the V. On his left and on his right, just behind him, are usually two experienced pilots. And then behind each of them is a new or inexperienced pilot. And behind each of them is a veteran. Now, because of prop wash (which is simply air churned up and disturbed by the revolving propeller) it is impossible for one plane to fly directly behind another and at the same altitude. Believe it or not, the air just back of the first plane is like a greased pole. You just can’t stay on it. Your plane will slide off to the right or the left. Therefore, in order that the plane behind will maintain its position, it flies a few feet above the level of the plane ahead, and a bit to the right or left such as the case may be. And the plane behind that flies a bit high. And so forth, right back to the last plane. In other words the planes on both sides form a flight of steps that slant outward and upward from the leading plane. WHEN you speak of the left and right side of a formation you speak of them in reference to the right or left side of the leading plane. And the left or right side of a plane is its pilot’s left or right when facing forward. Therefore No 1 plane on the right is the first plane on the leader’s right. No. 2 plane is the next one back, and so forth. And the same numbering holds true for the left side. So by checking back on what I said about the two inexperienced pilots, you will note that in that seven plane flight one inexperienced pilot, was No. 2 plane on the right. And the other was No. 2 on the left. Now, don’t rush me. I’m going to tell you why. It’s simply for this reason. The greenhorns are protected in front and in the rear. In other words in case the flight is attacked from either the front or the rear, the attackers will smack into veterans first. They won’t be able to slip down and take a crack at the greenhorns when veterans aren’t looking. AND as an added precaution against that, there is sometimes a veteran who flies what is called Top-cover position. You will note that that position is shown in Fig. 1. He flies in the center of the V, but at an altitude higher than any of the others. And so, in that particular formation you have the leader and two veterans keeping a weather eye on the air above and in front. You have two more veterans doing the same thing behind and above. And you have a lone veteran riding herd above the center of them all. Now, before I go on with other formations just let me mouth a few last words about the V. That is the way a flight would go over the lines. However, maneuvering in formation is a rather ticklish job because each plane is so sensitive on the controls, and because of varying air currents. Naturally, planes used in the war were not as stabilized as the ships of the present time, and therefore any idea of fancy flying in formation was OUT. The formation could climb and dive together. It could bank to the left or the right. But looping together or rolling together wasn’t tried—and for two reasons. First, it was too risky. And second, it wasn’t of any value. However, banking to the right or the left was of value, for the simple reason that the formation had to turn some time. They didn’t go across the lines flying straight and then go right on around the world until they hit their own field. And so, of course, a way was doped out how to turn around to the left or the right and still maintain the V formation. It was done in two ways—not both at the same time! Once the leader signaled a bank to the right, the pilots flying ships on the inside of the turn (ships on the leader’s right in this case) would throttle their engines and more or less stall around. And the pilots flying planes on the outside of the turn (the leader’s left in this case) would speed up their engines and go fast. Naturally the reason for that was that to make the turn, they had to fly a greater distance than the ships on the inside of the turn. And then, of course, when the formation was headed straight again the pilots on the right would speed up their engines again, and the pilots on the left would slow up their engines—’and thus everybody would keep formation position. The second way was really the most effective, because it did not necessitate the trouble of throttling or goosing the engine. And also it made it possible for the V formation to turn quicker and in a much smaller area. It was executed this way. Again we’ll have the leader signal a turn to the right. (He’d signal by wabbling his wings and pointing his right arm to the right. Or he might just dip his right wings, and then start to turn.) But anyway, let us say that he has signaled a right turn. As he started to turn, the planes on the inside (his right) would dip down to the left then up and over to form position on his left. At the same time the planes on the outside of the turn (his left) would climb up to the right and then down to form position on his right. In other words the right and left planes would simply change places. The ones on the inside of the turn going down to the left and up. And the planes on the outside of the turn going up to the right and then down. Of course a turn to the left was made in the opposite manner. So much for that. Nope. One more word. The flight would cross the lines in formation but once they were attacked, or did the attacking themselves, the formation would soon break up. Because no matter how much you may slice it, a dogfight in the air is an individual against individual affair. Once a fight starts its just the same idea as when the advancing wave of soldiers reaches the enemy line. A general free-for-all with the best man winning. You can advance, attack, and retreat in formation—but during the scrap the formation goes by-by. NOW, by squinting at Fig. 2, you will see what a V of Vs formation looks like. 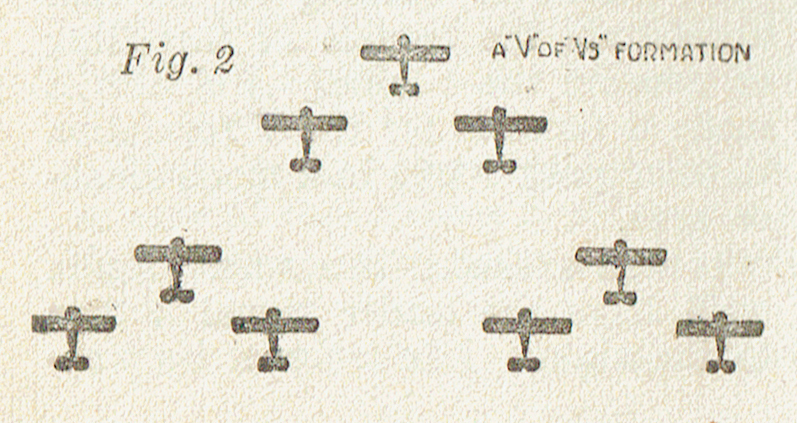 As in an ordinary V formation there can be as many planes as you want in each V. But in a squadron there are usually three flights; A, B, and C. Therefore, on a squadron patrol the formation flown is by individual flights, with the flight leader heading each group. And we call it a V of Vs because each group is in the form of a V, and all three groups form a large V. Maneuvering is, of course, just the same as with one V only on a larger scale. Fig. 4 is a formation that was seldom used during the late mix-up on the other side of the big pond. It’s called, “line formation in echelon.” As you will note it’s simply a V formation with one-half of the V missing. The planes are like a flight of steps. And that type of formation was for ground strafing a small area. The ships came down, one after the other, and let drive with guns and bombs just before zooming up for altitude. 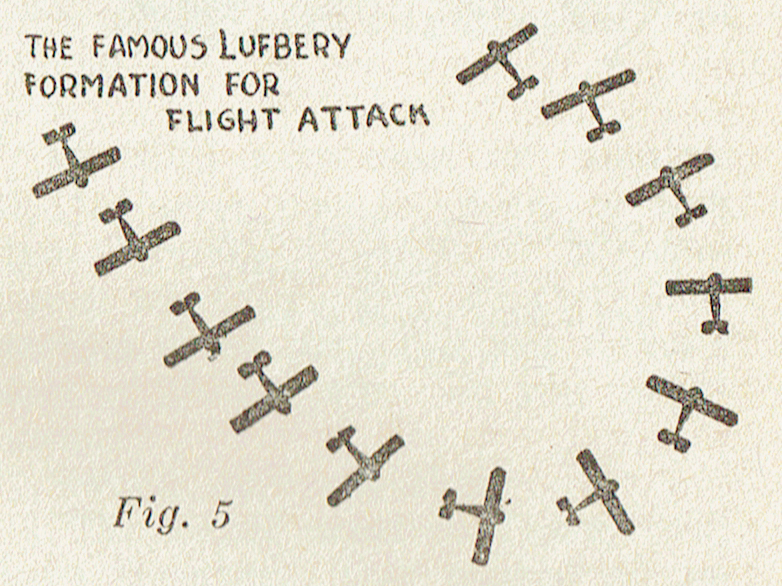 From echelon formation it was but a simple matter to form what was known as the Lufbery Circle, Fig. 5. (So called because it was used extensively by the great Lafayette Escadrillo ace, Raoul Lufbery.) As you can figure out for yourselves, regardless of its name, it is simply a follow-the-leader formation, or a ring-around-the-rosey affair. But its uses and its advantages were most helpful. It was used not only for trench straffing, but also for air attack defense. A pilot in a pursuit ship doesn’t have to worry much about what is in front of him, for the simple reason that he can see forward and shoot his guns forward. But, behind him it is another question. He can look behind, but he can’t shoot behind unless he turns around. SO that makes the line formation in echelon and the Lufbery Circle, or follow the leader formation, a great help to each man’s tail. In other words you dive down on a trench, spray it with your guns, and zoom up without worrying much whether a load of nickel jacketed steel is going to crease the seat of your pants. And you don’t worry much because the pilot behind you is taking his turn at spraying the troops in the trench, with the result that they are too occupied with getting out of his way to turn around and blaze away at you as you zoom up. And in the case of the Lufbery Circle, it wouldn’t be healthy for a Hun to try and drop down on the tail of the ship in front of you because you would simply pull up your nose a bit and chew off the soles of his field boots with your bursts. 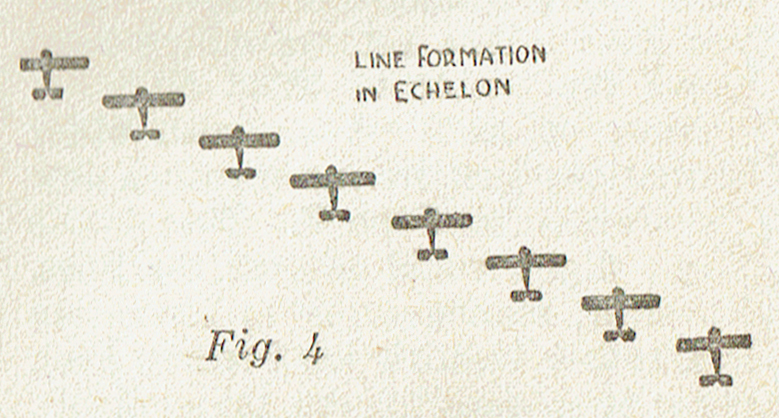 Incidentally, line formation in echelon, or follow the leader formation, was good for bombing work or photographic work. It enabled the pilots to bomb or snap, one at a time, the same spot on the ground, and while doing it be more or less protected from the rear. That is, each plane covered the ship ahead, with the exception, of course, of the last ship. But the pilot flying that ship was the only one who had to pray to Lady Luck to keep Spandaus lead away from him. And even he was protected if the planes formed the Lufbery Circle. And so there you are, a few words of wisdom (?) on formation flying. In general, formation flying- was okay before and after the scrap. In fact, as you can figure out yourselves, if you’ve kept your ears open, formation flying or flying in formation was absolutely essential to effective patroling. BUT, in a scrap?—nuts to formations! Pick your man, and go get him. That was the idea. And when it was all over but the shouting, if you were still in the air, gather around your leader and reform your formation.